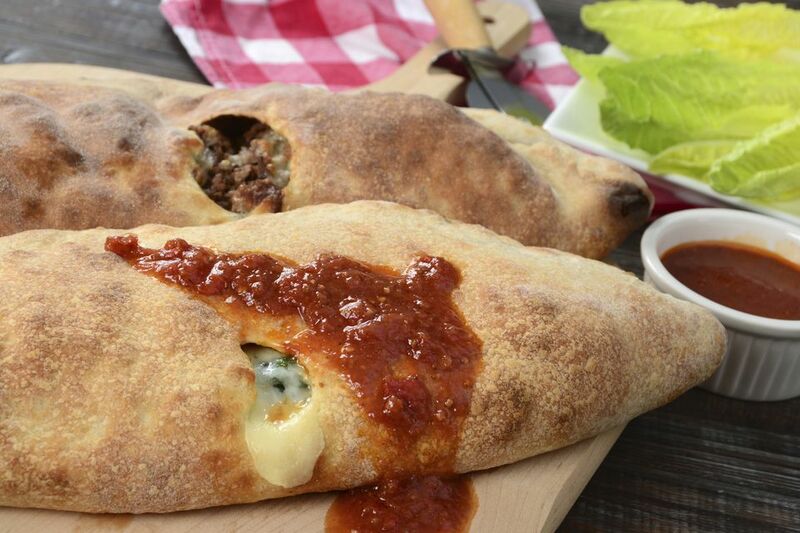 A recipe for sausage bread, pizza dough stuffed with sausage, mozzarella cheese, and Parmesan cheese, then baked. This makes an excellent game day snack. Divide the dough for 2 to 4 smaller calzones. Heat the oven to 400° F (200° C/Gas 6). Prepare pizza dough. Use frozen, thawed dough, a bread machine recipe, or other. In a skillet or sauté pan over medium heat, brown the sausage, stirring and breaking up, until no longer pink. Add the oregano and garlic and continue cooking, stirring, for 2 more minutes. Shape the dough into a rectangle about 8- x 12-inches. Top the center of the dough with the sausage mixture and cheeses. Drizzle with pizza sauce or tomato sauce, if desired. Fold the sides of dough over the topping, overlapping. Enclose the ends; brush with melted butter. Bake on a lightly greased baking sheet or baking dish for about 20 minutes, or until browned. Cool slightly on a rack then cut into 1-inch slices.